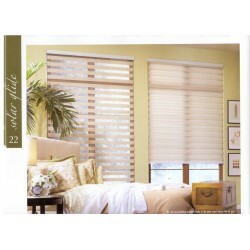 Zebra Shades provide a fashionable alternative to the traditional roller shade. Featuring a stylish, yet functional fabric panel that combines sheer and solid fabrics to offer even more control of light and desired privacy levels. Closed, these versatile shades offer complete light control and privacy. Raise the shade and align the sheer fabrics to allow light to filter through, while maintaining some privacy. Raise the shade completely into the sleek designer headrail for a perfect, clear view through. Advantages of draperies, shades and blinds into a single design. Stylish looks with a gentle capacit..